Barbecue season is already cooking in 2012. What better time of year to air a show that goes in depth into the World Series of Barbecue, The American Royal Barbecue Contest? 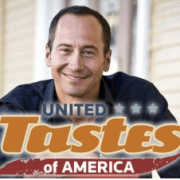 In a recent episode of United Tastes of America, Host Jeffery Saad took Cooking Network viewers on an in a behind the scenes look into the many different aspects of one of the largest barbecue contests in America. The American Royal. For those of you not familiar with The American Royal, it is 32 year old KCBS sactioned barbecue contest that draws over 500 of the best barbecue chefs in the world to Kansas City, Mo for the 4 day contest. “The Royal” as it is called has an invitational division in which only teams that have won a grand championship that year can compete and an open division in which almost 500 teams cook for one of the most prestigious titles in the country. Saad followed Tuffy Stone and Cool Smoke barbecue team as they cook their way through the American Royal Barbecue contest. Tuffy explains his spice rub, brisket trimming, rib prep, fire building principles, explains taste and tenderness in brisket, and even lets Saad help pick which brisket he turns in for the contest. Tuffy gives a basic explanation of cooking brisket and ribs without giving away any of his secrets that has made him one of the top cooks on the barbecue circuit. Mike Davis and the Lotta Bull team were the visited next and explained some of the tricks that have made their chicken some of the best around. Davis explained how he cooks chicken on a higher temp than other meats and explained how he uses 2 different rubs at different times in the cooking process to give his chicken layers of flavor. Davis also demonstrated how his sauce is applied to give his chicken a wonderful appearance. The highlight of the the show for me was the portion with Kansas City’s own Rod Gray of Pellet Envy barbecue team. Rod was busy catering for a large party at the American Royal but took time to show Mr. Saad about the meat candy that is a Burnt End. Mr Gray shared the story of how the burnt end was invented and explained how they are made. If you are ever in Kansas City, do not leave without having an order of burnt ends. The American Royal is not just meat. It has side dish competitions as well. Saad visited a lady that was entering several of the side dish competions and highlighted several of her creations. The show ended with the awards ceremony with Saad and Tuffy Stone together. Tuffy took home a ribbon for his ribs and a 1st place trophy for brisket. Cool Smoke finished 3rd overall out of about 500 teams. This show was everything I expected it to be and so much more. Saad put together a show that gave some insight into what goes on at a KCBS bbq competition. No great cooking secrets were given away but for the backyard barbecuer, there was plenty of information to be absorbed. Jeffery Saad’s questions to the cookers he followed were intelligent and provided valuable information to his viewers. I really enjoyed the show for its entertainment value and the entire way it was presented. If you missed the show on The Cooking Channel Jan 31 there are still more opportunities to see it. United Tastes of America: Kansas City Barbecue Festival will be shown again on Feb 12th and 19th. I recommend that you check it out. Jeffrey Saad’s twitter handle is @jeffreysaad and you can find information about his show at cookingchanneltv.com.